Set up and Connect to the Firebird Database. [NB]: please follow up the blog at : https://rongsheng007.wordpress.com if you are reading the article in facebook or other places. Thx. Firebird database is a database based on the Borland Interbase database. 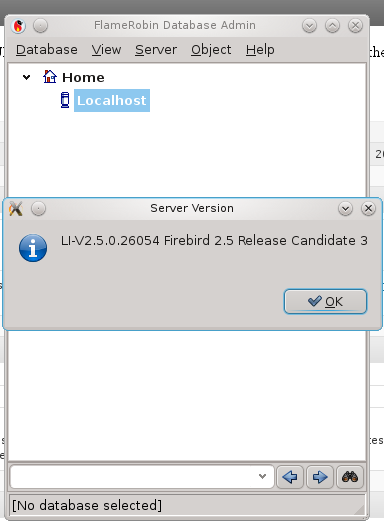 Firebird provides powerful features both on it’s server edition and embedded edition. I personally use this database in desktop application development. This software becomes my first choice since it is free and softwares can access database file without building up the server. (embedded version). BTW: Firebird database seems to support a variety of operating systems. Here’s how we do it in Linux/UNIX. then set the new UNIX password. Now you should be in the folder: /opt/firebird , if you are not in this folder, please switch to this folder. note: replace to the password you just set and do not ignore the ‘;’. till now, you have successfully configured the firebird database, use “quit;” to exit the command prompt. If you want to start the sever rather than using files to open it, you need to start the fbguard session. open a terminal and direct to folder : “/opt/firebird/bin/”, then run the following command as root user. now the system is started, you can run a GUI tool to examine, try “FlameRobin”. here is a screenshot of the configured firebird database.